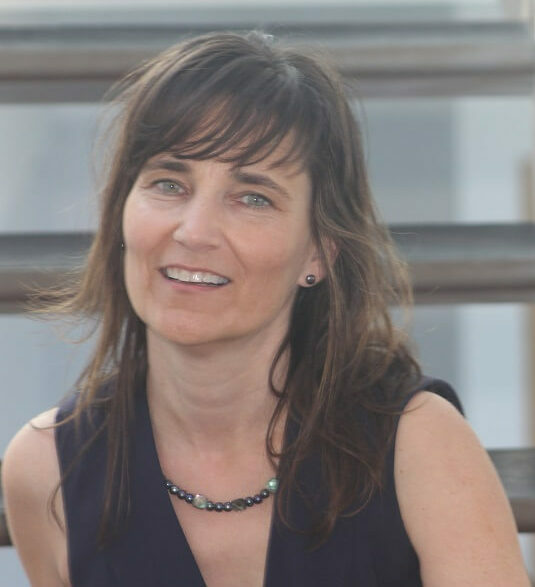 This week we are thrilled to bring you an interview with Dr. Andrea Davis, the founder and director of Greenhouse Therapy Center in Pasadena, California. She is a licensed clinical psychologist and Expert DIR® provider. Dr. Davis is also an active DIR/Floortime® advocate with the Floortime™ Coalition of California (DIR® FT™ COC). 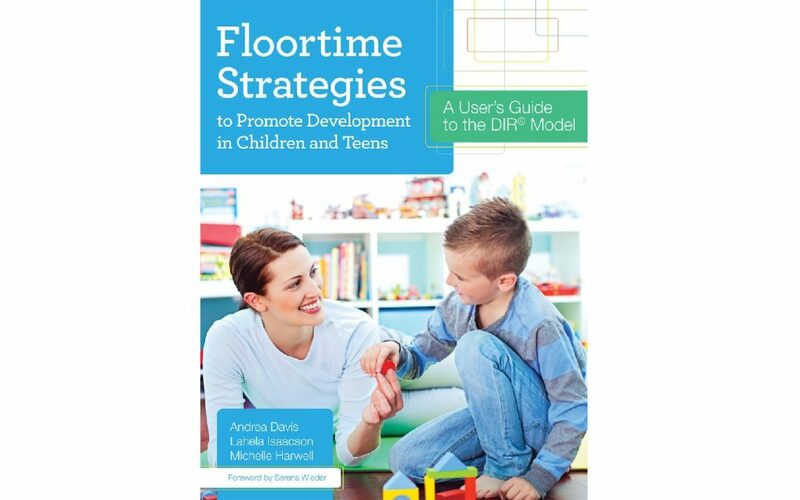 We discuss the DIR® Model, how parents implement DIR/Floortime® and the book she co-authored, Floortime Strategies to Promote Development in Children and Teens: A User’s Guide to the DIR® Model. Affect Autism: Could you tell us a little bit about how you came to write this book? Dr. Davis: Well that’s an exciting process to tell you about. We at our center have had phenomenally talented Floortime specialists working with us, with our families, for a number of years, actually since 2001. And we’ve had the great experience of watching the kids grow and the parents grow in the model, and really seeing that children or teens who are getting Floortime are getting a growth experience that they don’t get in any other kind of approach of treatment at all and that they really, really need to understand themselves and to understand the world around them, and to become warm and intimate and engaged and joyful and spontaneous and creative. We are thrilled about the work that we are doing here but we did see that we kept bumping into one problem. Our Floortime specialists were so talented at applying Dr. Greenspan‘s and Dr. Wieder‘s model that sometimes it was much harder for them to help a parent learn the same approach and that was one of their main jobs that they would often find difficult to put into words what they could feel instinctually in their gut is the right thing to do with a child at a certain milestone or at a certain stuck place. So together with Lahela and MIchelle we spent many hours laying out all over our entire gym floor papers that would try to capture the words that could get across, ‘What is it that we can do for our kids? What is Floortime? It’s more than just what was originally maybe boiled down a little bit too much to just attune to the child and just follow their lead. There’s so many other things that are part of Floortime as it’s grown and developed as a model that we wanted to capture in a systematic way, in an organized way. Everybody learns differently, as you know. You may learn better by just getting the whole picture, by reading The Child with Special Needs or Engaging Autism and getting a feel for what is this way of thinking about children. Other people learn better with a step-by-step strategy at a time. Let me try one thing, and practice that, make it habitual with my child before I try to do something else too that also will help my child and my team. Affect Autism: So it sounds like you really did make this book for parents. Dr. Davis: We made it for parents and especially for the para-professionals or professionals who are working with parents. We’ll have parents bring their own manual to session. We’ll have the Floortime specialists bring their manual and they’ll really select one or two pages, they’ll just open the book to one strategy, leave it open during the session and then refer to it to see how did that feel, you know, when you tried just turning every action into an interaction, for example. We’ll just focus on that,. ‘Let’s try it, I’ll demonstrate it for you. You try it. How did that feel?’ It’s a lot easier to get this model across. That there’s things that we do to promote our children’s emotional, social and intellectual development that really work in a very positive way. Affect Autism: And it sounds like–also I can imagine, just from looking at the book myself–that therapists working with children can really use this as a refresher as well. If you had your certificate from ICDL three or four years ago and you’re practicing Floortime regularly, this book is fantastic for reminding us of all the important points about what to apply when working with children and parents. Dr. Davis: It does help us as a refresher, certainly. We use it all the time when we’re talking about the families that we work with. We’ll look at videos of sessions and then we’ll stop and check in and say what did that specialist or that parent just do that really maximized what the child was just able to do. Let’s put it into words, because words and the concepts that follow the words really help us to know what we’re doing as therapists. It’s particularly helpful for therapists in almost every situation we have to write about what we’re doing. We have to write to get funds…for an insurance company, or a school district, we have to describe what we’re doing. And, they all want to see well what are you doing with the family? What are you doing to help the parents? And this specifically is the easiest way. We actually will list out in our reports numbered strategies: This is what we’re working on right now to get to the goal that the family has for the child at that milestone. It makes it easier–a lot easier actually– to write our reports which we know, therapists…that’s the bane of our existence. We love working with people. We don’t like the paper work. But this actually makes our reporting process so much simpler and more efficient so we can fully focus on the part of our work that we went into the work for. The field that we love is helping people, helping parents get more effective with their children and teens. Affect Autism: Right, and certainly things in California are a little bit different than they are here in Ontario and throughout Canada. Namely, that you go through insurance providers and here we have public health. But we are struggling here in getting developmental therapies funded. British Columbia recently had them approved for funding, but I imagine—similar to you guys, the therapists here also have to have some kind of written proof even if we use our special services funding that is a type of funding we have here, we also have to submit receipts and they might ask for more information, so this is a good guide to that. Although I don’t know if anybody here would know about all the different strategies because Floortime is so new to Ontario. Dr. Davis: We are still struggling. That’s why we have the DIR/Floortime® Coalition of California. The coalition is this non profit of parents and professionals. We’re trying to make it so that every part of our state can actually find a way for families to get the funds, to get their child or teen into Floortime therapy, because it’s not the case that in California…it’s very rare to be able to find a funding source. This book does help us because even if they’ve never heard of it, when the strategies are so simply described and named, people go “Oh I can see how that would work. Oh that makes sense.” They can immediately see what you’re talking about. It’s a little bit easier when you’re tongue tied when you’re trying to explain it to a school district that the family wants the school district to pay for this, or if you’re trying to explain it to a public funding agency. Most of our clients get public funding and it varies completely where you are in the United States or Canada or within a particular State, whether your funding agencies are really supportive or not. But the research behind the effectiveness of DIR/Floortime® is… now we’ve had published randomized, controlled trials that show how effective it is as a treatment method, you can’t say anymore there’s not enough evidence or research behind it. There absolutely are published, peer-reviewed research articles, NIH grant studies showing how effective DIR/Floortime® is, so now we can just say, “Ok, but here’s specifically what we do because the strategies are written in very plain English for anybody to understand and we get head nods right away. People say “Oh, I see what you mean. Oh, you’re helping parents to work with their child and use specific strategies. That makes perfect sense how to help them.” And they’re more receptive to us for the funding. Affect Autism: And certainly, that is a myth about DIR/Floortime® that it doesn’t have an evidence base like ABA does, and what has been happening over the last, even 10 years, since the review study in 2008, is that there’s less and less research supporting ABA approaches and more and more research supporting DIR/Floortime® and developmental approaches in general. So I think this is something that—moving forward—parents are going to be looking to, and your book is fabulous for being very accessible to parents. Can you talk a little bit about what it is about breaking it down into these strategies that really helps parents and where is the best place for them to start when they get a new diagnosis, and they’re overwhelmed and they’re told so many different things by so many different professionals, and they somehow narrow it down to Floortime. “I’m gonna try this out.” And they get your book. What’s the first thing they should think about? Dr. Davis: Well, that’s a great question. One of the things that would help a parent to think about is, “How could I make 20 minutes available where I shut out the world, and I turn off/put away my phone, and my laptop, and the work that’s waiting for me, and really just tune into my child and try some of these approaches. “How could I make that happen?” and “Who can help me make that happen?” People who are concerned, maybe to just help me protect 20 minutes at a time. Dr. Greenspan sometimes talked about this: Ideally 8 20-minute segments throughout the day, and that’s the ideal, but starting with one 20-minute segment is even better than zero by all means. And if older children or neighbour kids, like older kids, or spouses, or, you know aunties and uncles can get involved. If they see how fun it is, and how meaningful it is to see this child blossom just by playing in strategic ways, then they might want to offer a 20 minutes. Everyone can give 20 minutes. It’s actually a reasonable thing to ask somebody to do, and when they see the benefit, it’s so rewarding, that they want to keep going. That’s why when we train specialists here—they’re very busy people; they’re grad students, they’re doing other things in their life, preparing for their careers, but they stick with this work. They stick with the families sometimes 3, 4, even 5 years because it’s so gratifying to play in a way where you see the child’s development happening before your eyes. So I would say, just making time. Maybe a couple of 20-minute periods on the weekend, each weekend day, to try applying a new way of thinking about your time with your child. You’re not so much there to direct and control and teach all the time, but to get to know what works with your child, finding that shared joy, that mutual interest in whatever it is that the child loves, and finding that passion together. Part B gets a little more detailed into how we work with our child’s individual differences. Again, those are overarching principles. And then we launch into working with Milestone 1: Regulation and attention. “What are we going to do in our time together that’s going to support that regulation?” So that’s where I would begin. Another thing about the book that people don’t realize is the Appendix is another section of strategies that have to do with handling the difficult behaviour. We draw from a number of different approaches that we’ve used effectively with parents, training parents…how we’re working most of all on development because this is about working with kids with developmental delays, developmental challenges. So their primary problem is not misbehaviour, their primary problem is helping their brain get back on track, making the connections that are missing. But we know that parents have to deal with everyday with difficult behaviours, so what do we do about those? I’d say, turn to the Appendix and just read that thing through. I think there’s only 10 strategies or so in the Appendix, but they’re all extremely helpful. They’re kind of rich and pithy. So I would recommend just reading it through so that they’re all available in your mind when difficult behaviours come up, and then talking about that with your team. Whether it’s your special ed team, your speech and language people, O.T., your pediatrician, really talking through it. Maybe you do have a Floortime professional. Talking through what strategy might be right for me to try right now with this particular problem that we’re addressing. I hear parents say that all the time in public places to their kids, and with our children with developmental delays, we really have to back that up and realize what you said: this is not a behavioural issue, it’s a developmental issue. It has to do with emotion, it has to do with affect and anxiety, and the developmental strategies really support getting through that. And I think families get into such a routine and rut of what they expect, how they handle it, and it ends up being a downward spiral you hear children as they get older and the problems get worse and worse, and intervening early in a developmental way that supports the child, and makes the child feel safe, and that they can trust the the parents really understand what’s happening for them and are supporting them, as opposed to trying to stop what they’re doing makes all the difference in the world, and just even from what we’ve seen with our son. Dr. Davis: Well I agree with you and I do think that thinking about this the way you just described it, we have to understand that the gift of what Dr. Greenspan gave us was looking at the arch and trajectory of normal neurological development is all based on attuned relationship with a caring and supportive caregiver. That is what strengthen and grows every single person…every single child…whether they have challenges or not neurologically. So really seeing that relational support is the core of a child going through their developmental challenges is going to be really quite of a transformation or a conversion for some families. When they first read, they’re going to be amazed when they read Dr. Greenspan and Dr. Wieder’s work, think that this makes sense in my gut but I’ve never heard this anywhere else. Dr. Davis: Yes! And “Why?” And that’s the place to bond. Floortime is… when it’s going well, I often compare it to being like a great date. It’s like both people’s eyes are sparkling, and they’re fully engaged with one another, and they’re enjoying the experience of being together. What does it mean to be together? And it absolutely doesn’t matter what it is they’re doing. So, they can be fully absorbed and they’re not thinking about what it is they went in to do. The relationship is clicking. And that’s the idea we are looking for, and we have ways to make that happen with your child. It’s like falling back in love with your child again when you realize, oh, the core of their development is going to be around this attunement and finding what their passions are so that I have the power in my life to then challenge them to do the next hardest step. It’s not going to come around with threats, manipulation and focusing on the negative. Now, if you’re anxious because of your child’s problem behaviours, that’s when I think some of the strategies in the Appendix are important because you have to feel like, oh I can make sure that I’m safe, he’s safe, that everybody’s safe. You know, I’m not going to follow his lead when there’s danger here. I’m not going to be so supportive that I feel out of control of his safety. There has to be that line. I’m not doing Floortime play when there’s a safety issue at hand. We shift over to managing their safety and everybody’s safety when there’s a danger and then we can use all the Floortime principles and strategies to help them become more aware and reflect on those situations when everybody’s calm, checking back in on feelings later to grow their awareness of themselves and their emotional state and their coping mechanisms for better choices in the future. But I do think parents need to be empowered as well with what am I going to do when my child is having a big problem. I don’t have to just feel helpless, and just try to grin and be nice. I have ways to stop it and to redirect, but to always see that connection is deepest and most important value for teaching them in the future to not have these situations coming up at school or in the community or at home. Affect Autism: And I think it is powerful to have that toolbox of strategies ready to go and it certainly takes a bit of time. I know even when we first heard of Floortime and hired one of the very few people in Ontario that was trained at the time to work with our child, I would do the dishes and think “Oh, good. He’s getting his therapy.” It didn’t really sink in for awhile that this is about relationship and us working with him. And that overwhelming eight 20-minutes sessions a day just seems so scary. So just starting with 20 minutes and what do I do in those 20 minutes? Now in the forward of your book, written by Dr. Wieder, she says “At every successive level, it’s important to keep in mind the DIR concepts and principles highlighted in this book and to consider specific goals for each interaction.” And I know in conversations we’ve had when discussing this interview that we would do, I recall you mentioning specific goals when you discussed the strategies approach. So I guess it’s kind of a balancing act between just being with your child and having this—like you said, it’s like a good date where it’s back and forth, but also having a specific goal in mind. So can you elaborate a bit on the practice of setting these goals with parents and how you see them play out? Dr. Davis: So what we do with parents at our centre is that every 6 months we sit down to review where we think the child is now, and we have the Floortime pyramid to look at the stages of development but within each stage of development there’s going to be specific concerns that the family has about their child and we help them to articulate that and put it into words what it is that their child needs to be able to do. For example, if we’re talking about Capacity 2, engagement, relating, attachment, they know that the child could be stronger in that area, but what we want to do is really, really focus in on what about that area. Say it’s a 12-yr old and maybe he’s really verbal and he wants friends but we notice when he gets with his friends or with kids his age or peers, he’s not seeming to really click, so you’re concerned about his engagement—the quality of his engagement—so we can help a parent go from that concern into actually writing a specific goal, because when we’re asking for funding there has to be goals, measurable goals and status that we check in on all the time, so maybe it’s that he’s sticking with the conversation rather than always bringing it back to his one particular passion. So, persisting in a conversation for 5 minutes on a non-preferred topic with adult support at first, so there’s somebody playing with the kids and providing all the sensory input or the emotional support that’s outlined in the strategies so the child could be successful at that. So then we would turn to Section 2/Capacity 2 and say well what does the adult in general do for that? Overall I think it’s really connecting with the child to help them learn to connect with their peers. So then we’d pick out a few, appropriate for his age and his level, strategies that the parents could do and work on or maybe their aid at school. This also helps to explain to the aids at school what they could be doing better to help the child reach their goals. So we would outline these under the goals: These are the strategies that we need to use to help the child engage first with the adult and then engage longer with a peer, which is a harder challenge. Does that make sense? Now this was a concept that took a few years for me to acknowledge, myself, and only recently in my DIR/Floortime® certificate courses have I really come to understand what it means. So I imagine you find that this is a major hurdle for parents—some more than others and how do you support parents in this effort? Dr. Davis: That’s a great question. It’s scary. It’s scary to think about for all parents of all kinds of kids how who we are affects who our kids are, how our limitations can hold them back, how our gifts have them experience more of the world, but we don’t want to think about that sometimes. That’s a feeling or thought that we quickly want to distract ourselves from is that we are here to help our children learn and grow. And Floortime is a systemic model, a family-based model with everybody growing together. If our ultimate goal of what Dr. Greenspan talked about at Capacity 9 of the ability to self-reflect, to be aware, to have that internal psychological experience and flexibility that comes with that, then obviously we as the parents and professionals are needing to grow in that area as well if we’re going to be helping our kids get there too. So that’s a major piece of the work we run into absolutely. Parents come in with differing levels of anxiety, self-distraction, denial, whatever works for them. It’s just really, really, really, really really stressful to be raising a child who has neurological differences. So it takes a safe relationship—entirely safe relationship with the professional. They have to feel like they’re not being judged or watched or criticized in a negative way, that it’s a supportive, that the person coming in who’s maybe had the training in DIR/Floortime®—they’re on a process too of getting to know themselves and what are their constrictions and limitations and are they constantly working to grow, be more present, more aware to themselves and to the other and that helps our parents. It does take a lot of time for them to learn oh this isn’t a critical, judgemental, one more relationship where I have to be careful what I say or what I show, that they can be comfortable to look at themselves, to be honest with themselves. And one way we do it a lot is through sitting together and supportively watching video tape together of the interactions because it’s amazing what we learn by watching ourselves with our child. We get into habits we’re completely unaware of but watching ourselves on video with a supportive other person present we can see oh that moment was really helpful, that habit of mine isn’t as helpful and then starting to look at why. Why do I get too fast there, or why do I tend to do the thinking for my child? What is the anxiety that kind of drives that even though I know that I still kind of fall back on doing the thinking for him, or making it too easy for him, and not letting him struggle, for example, or just sort of being the one to inject the next idea and the next idea in creative play. What’s hard for me about sitting and waiting to see what his idea is next or giving my daughter the chance to pause and struggle and come up with the next move in the game, whether it’s a ball game, or a board game, or play with characters, or role play, it doesn’t matter. It’s the same process of looking at ourselves and saying why do I do those things each time? And feeling safe with a professional or paraprofessional to openly, non-defensively, start to understand ourselves, our stories, our own histories, and how that intersects with who we are and where we get stuck in the work. Affect Autism: And that’s hard for parents, I imagine—especially for some parents, it’s very hard to watch themselves on film because they might not want to take that critical look at themselves and I think that’s why you highlighted the importance of the safety of that relationship …with the therapist. Dr. Davis: Yes, and I think they may feel comfortable too by starting looking at video by really focusing on what the child or the adolescent is doing, how they’re progressing. I think that’s highly important/essential to parents. They want to see. They want to see oh yeah, he wasn’t able to engage that long before. He wasn’t able to stick with an idea that long, or whatever the next step is for him or for her. They’re eager to see that on video, so we kind of start with that. Let’s start with let’s look at where your child is in this particular play interaction. We looked at one yesterday with a boy who’s been working with us for about 3 1/2 years with the same specialist and for the first time ever he was really co-creating with her versus always the same idea over and over in the play; it’s repetitive and boring. He was laughing with delight. He was falling down like drunk with enjoyment. He was tricking her, and she was getting tricked with her character—her little Yoshi character. But then when she would add an idea, he would riff off of that. He would improvise from that, so they were actually building something together. We think co-creativity is one of the highlights, it’s the ultimate goal is can you make something happen together with another person pleasurably because that’s what we want in life. We want our kids to be able to make things happen with a partner, whether it’s a business partner or a life partner. That’s what it means to be really essentially human, is to be creative to participate in that divine capacity to take nothing and turn it into something, and that’s what we do in Floortime is we take a blank screen and together create something wonderful, fun, engaging and beautiful together. Affect Autism: I can’t help but compare that to the behavioural learning theory metaphor of the blank slate where it’s such a different approach that we can train your child to do anything, just give them to me as a blank slate which is so different than an intrinsically motivated child, where it comes from affect and it comes from their own motivation as opposed to being trained from the outside. Dr. Davis: Right. Now, that example, my example is that this kid has always played with the same characters: all the Mario Brothers characters, and because that’s his passion, that’s what we use. Those are our therapeutic tools. How are we going to get him to the place where he’s having such deep joy, attachment, intimacy if we’re presuming and requiring him to follow our agenda all the time, where here we’re promoting his agenda and look what flourishes. Like you say, his intrinsic motivation. Now he can do so much more creativity and true engagement. We’re still using his passion of his intrinsic motivation, that’s exactly right. You cannot train passion, you cannot train motivation, you cannot train creativity, you can’t train the desire to understand, you can’t. We don’t want our kids to, we don’t tell them in Floortime “Look at me” because that’s not even social behaviour. It’s not social to look at somebody. It’s social to want to know somebody, to be curious about what’s going on in somebody else’s insides. That’s what Floortime is training is that social curiosity so that someone looks in someone’s eyes to find out what are you feeling and what am I going to do in response, my reciprocal response to you. So that’s not something you can take as a blank slate and train with rewards and consequences. Affect Autism: Now I know for ourselves when we tried figuring out what are we going to do, you know, after our diagnosis, definitely one of the hooks for Floortime was hearing stories about children who—seen as young children our son’s age or younger, who seemed to have less skills than our son had, seeing videos of them ten years later, and how interactive they were just brought tears to my eyes because you suddenly see hope in what you have for the future of your child. And every parent is in such a frantic search when you get that diagnosis: oh, what’s going to help me? And there’s so many magic cure promises out there when really, you know, it’s a natural process to develop as humans and the trajectory is long and might not be as steep as others, but it comes, and seeing that progression—it’s slow, but it’s there. Dr. Davis: It’s fundamental. We are raising human beings. We are raising creative, joyful human beings who desire to have intimacy and have their own natural passions that we’re going to honour when we do Floortime. But I think you’re right. The hope of this book, the hope of this approach is for parents to see that this isn’t all gonna to be doom and gloom. We can have children who end up coming out of Floortime—Dr. Greenspan was the first person to say this and I see it over and over—we have kids who’ve been a number of years, the families and therapists are both using the Floortime approach who end up coming out more emotionally aware and socially sensitive than kids who didn’t have any kind of a diagnosis or developmental challenge but didn’t get Floortime. We have lots of families come to us and say, this approach changes how I see all of my children. It changes how I see my relationship with my partner. It changes how I am as a human being, and how deeply I can relate and even the process of being a parent. So Floortime is like an amazing gift, and this particular book is a way to learn it a little bit easier than I hope…sometimes parents just can’t read the whole Child With Special Needs without getting really anxious or guilty because it’s a lot to try to fit in and incorporate so taking it a bite at a time, with someone helping you, with your team helping you is actually more manageable, but the results are beautiful. We have kids who are incredibly proud of what they can do with their friends. It’s just really heartwarming to see how they can grow as human beings in this approach because it’s the humane approach. Affect Autism: Right. Well I know certainly what I went through, which may not be what other parents go through, but I know certainly other parents do go through this as well, is you almost feel like you’re given some kind of life sentence that you have to do all of this therapy just to even maybe get to where other parents are with their kids without doing any work. And it feels so unfair, like oh, I have to do all of this work, everything’s such a struggle for my child. You just get overwhelmed at the beginning. And part of the…like, this is what makes your book so accessible to parents is that you don’t have to look at it that way. You know, I tend to over catastrophize things at first until I get used to them. It sinks in and then ok, I can handle this. And this book makes it about, you know, one thing at a time and you’ll see progress and it’s like a snowball. Once you start realizing that you just change a few little things, and everything gets so much smoother, the snowball rolls and rolls, and things can get a lot easier as you see your child develop and sometimes it takes other people to tell us. Like, we don’t live close to our son’s grandparents, so whenever the grandparents see my son, they’ll be like, “Wow! I can’t believe how much engaged he is! Oh, he’s so much more in tune to us! Oh, he actually came and hugged me! Oh, he looked at me today! And so, those kinds of things are so heartwarming because sometimes when you’re so in the mix, every single day in and out, you don’t even notice the progress that your child’s made because it’s very subtle and slow across time. Dr. Davis: That’s right. That’s another thing that I like to do is have parents see, you know, have their team fill out just a developmental chart showing where we were 6 months ago and where we are now because you get lost in the trees, absolutely, as a parent. Everyday is challenging for every parent nevermind when you’ve got so many therapies to attend, and so many goals to worry about but if you can see, oh, he’s really is making progress on the goals that matter to us as a family that help us to know he’s going to be happy or she’s going to be happy later in life, which is what you really want to know as a parent, is that your child is going to be happy later. That they’re not going to be lonely and sad. Affect Autism: …and that everything isn’t a struggle. The smallest things cause such catastrophic emotional reactions in a little toddler with autism, just to help him get through and cope, you’re just so worried, oh everything’s so hard for him. I want to make it easier for him, but I don’t know how to. Maybe what I’m doing is making it worse, and so Floortime really helps with that so much. Dr. Davis: It really does. If you think about yourself as we’re becoming a Floortime family. I think that’s easier than thinking we have to do all this stuff. We’re becoming a family that sees him in a Floortime kind of way, with his individual differences or her individual differences, but in mind as we problem solve together. I’ve enjoyed talking to you so much about these things. You know so much already and I wish that each parent could be as informed as you. That’s really what the motivation is for writing a book like this and organizing it this way, is that we want parents to feel empowered, and to have ways to get where they want to go. It’s obviously the most important job that you have, and if you’re not given the tools to do it, it’s just an inherent set up for stress and distress. We want parents to feel a little bit more easy, light and so hopeful and joyful about what they can do with their child and their adolescent. And then linking the two together, so “When adults attune to the child and to themselves, children learn to become regulated. 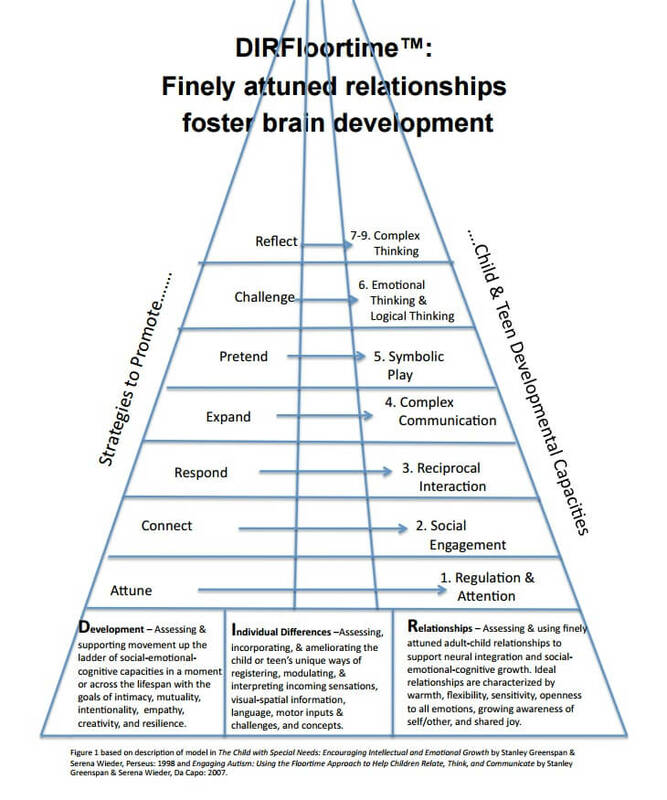 When adults engage the child, children learn to connect emotionally with others”, and so on through the nine capacities and then this wonderful graphical representation of it all in the pyramid that you have there. I would love to be able to show that on the blog if possible. Dr. Davis: I’ll send it to you so you can share that because I think that that is the core of this approach is that we understand that kids go up through these milestones maybe if we’ve been exposed to a little bit of Floortime. What it’s hard to understand is what do the adults do to get them there. And that’s what this book is about. Affect Autism: And how can parents, our readers and listeners get a copy of this wonderful book? Dr. Davis: You can get it through us at a discount. If you prefer to get it through Amazon, it’s always available. If you want a discount where you don’t have any tax or shipping and handling, you can just get it through our website: GreenhouseTherapyCenter.com and you can pay us by PayPal or by cheque or however, by credit card, but communicate with us via the website. Affect Autism: Yeah, I’ll put a link to that there. I’m looking at the page right now where you can click “Add to Cart” and buy it right there and it’s very reasonably priced. And I want to thank you, Dr. Davis, for spending time with us today at Affect Autism to discuss this wonderful book. And the good news is that you’ve agreed to come back and discuss a couple strategies in more detail in future sessions. Dr. Davis: Mmhmm. So I’m excited. Thank you very much. I’m so proud of what you’re doing and impressed by what you’re doing. Affect Autism: Well, likewise! Thank you. Dr. Davis: Ok. We’ll talk soon. Hopefully you enjoyed what Dr. Davis had to say and will check out her User’s guide to the DIR® Model. She will be back in the coming weeks to discuss some specific strategies from her book. Next week, we’ll conclude our stumbling blocks in Floortime series with helpful strategies for parents working with their children at FEDC 6, building bridges between ideas, or logical thinking.